The BØrg are a kind of Ikea desk set, I think. 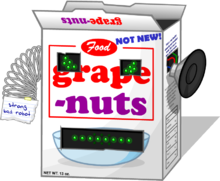 The Strong Bad Grape Nuts Robot is a robot that appears in the comedy website Homestarrunner.com. Grape-Nuts is a breakfast cereal developed in 1897 by C. W. Post, a former patient and later competitor of the 19th-century breakfast food innovator, Dr. John Harvey Kellogg. Despite the name, the cereal contains neither grapes nor nuts; it is made with wheat and barley. Post believed that glucose (which he called "grape sugar") formed in the baking process. This, combined with the nutty flavor of the cereal, is said to have inspired its name. Another explanation originates from employees at Post, who claim that the cereal got its name due to a resemblance to grape seeds, or grape "nuts." The cereal originally prepared by C. W. Post when developing the product was a batter that came from the oven as a rigid sheet. He then broke the sheet into pieces and ran them through a coffee grinder to produce the "nut" sized kernels. Then Bubs made a robot out of the Grape-Nuts box. AND a Speak 'N Spell! 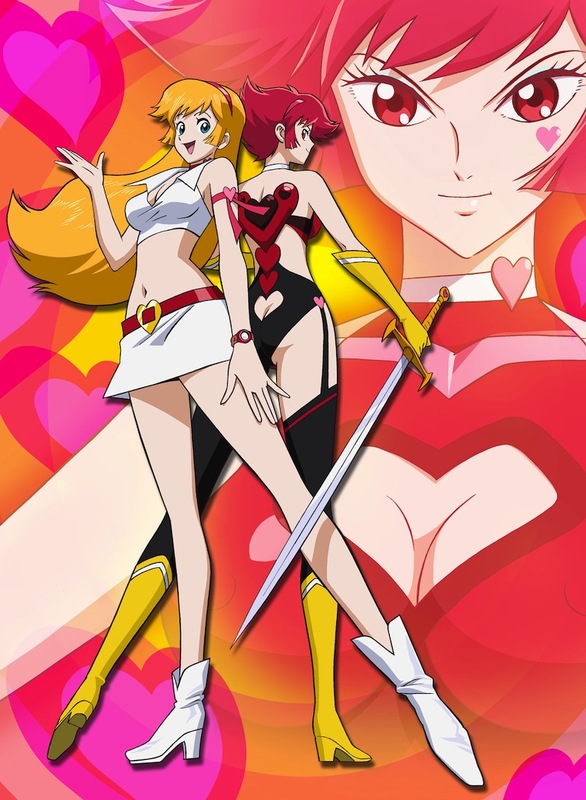 Cutie Honey is the android protagonist of the manga series Cutie Honey and it's many animated adaptations. By day, Honey Kisaragi seems like an average catholic school girl but when evil strikes, she transforms into the evil fighting Cutie Honey. Her father was a scientist and after he was murdered by the evil organization Panther Claw, she learned she was an android with the power to create matter from the surrounding air. She uses her power to change costumes frequently, often appearing in costumes to act as disguises, which, in some cases, give her extra abilities. Honey is at constant war with Panther Claw, made up of mutants and super-humans controlled by the ancient entity Panther Zora. In most incarnations of the character, Honey has sidekicks in the form of the journalist Naojiro and is little brother Junpei. The character has appeared in a number of manga and anime series, as well as several live action incarnations. Trivia Nagai's inspiration for the character of Honey comes from classic shows that featured protagonists who took seven different forms, including the Bannai Tarao mysteries and Warrior of Love Rainbowman. i thought cyborgs weren't allowed, i must've missed that change. There was kind of a grey area in the official rules. Cutie Honey owns, lots of good versions over the years, I liked that one live-action movie from 2004 too. Go Nagai is a hero. IDAK Omega 17 is a robot that appeared in the Lost in Space episode "Revolt of the Androids." When a rogue android named Verda was hunted down by a robot named IDAK Alpha 12, she decided to convince him to become more human in order to make him forget his mission. When Alpha 12's creator found out, he created an even more powerful android IDAK Omega 17. Omega attempted to destroy Verda until Alpha 12 destroyed him. Trivia IDAK Alpha 12 and Omega 17 were a parodies of Superman. Producer Irwin Allen really cheaped out on the costume. But my list was always based on the performance of each robot/android and not their design. When it comes down to it, the IDAK Omega 17 gave the most memorable performance of any fictional robot/android. In my opinion the best catch phrase ever written for a robot. Now how couldn't I give it the top slot. Francis X. "Clamps" Clampazzo is a robot who recurs in the animated series Futurama. He is a member of the Robot Mafia, which is exactly what it sounds like. Clamps works directly under the Mafia leader Donbot, which would be impressive, though it looks as though the Robot Mafia consists of exactly three robots, so maybe it isn't so impressive. Clamps has clamps for hands, which is weilds with relish against potential victims. In fact, any time the possibility of using his clamps comes up, he gets very excited. Clamps is also extremely aggressive and paranoid and often is frustrated by the idiocy of his co-worker, Joey Mousepad. Trivia Clamps is based partially on Tommy DeVito from GoodFellas.